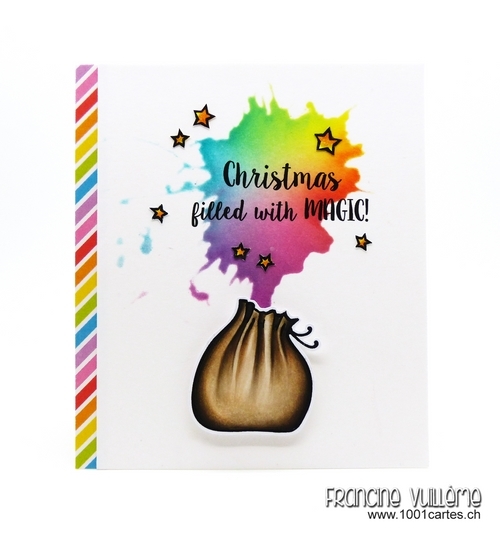 1001 cartes: Neat & Tangled DT - Magic! Neat & Tangled DT - Magic! Hi everyone! It’s time for a new card for Neat &Tangled! I used Santa’s bag that I colored with Copic markers. I made a splatter that comes out from the bag. I used a stencil that I sponged with Distress and StazOn inks. 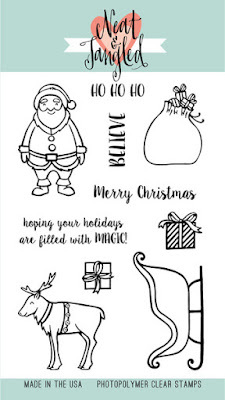 The sentiment and the stars are from the Santa’s Ride set too. Don’t forget to check out the Neat & Tangled blog for more inspiration from the design team every day! your copic coloring is fantastic! Swooning over your card - you are the queen of Copic coloring! Gorgeous card! I love that splash of color coming out of Santa's bag! Love the splatter!!! What stencil did you use?